When you want to know the diameters of the trees within a circular sample plot. Just stand in the centre, aim and point, tree by tree. 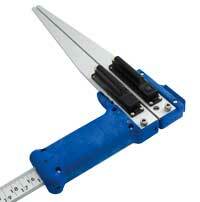 Read the results on your caliper scale or display; register manually or automatically. When you want to know the upper stem diameter of trees without having to climb, carry long sticks or heavy stairs with you in the field. When you need to know the size of branches on a tree, also those positioned very high up. When there are obstacles to reach a particular tree, for example water streams or wind throws. The Gator Eyes reaches well over 40 m or 130 ft.
Green Gator Eyes Laser pointers are visible also in areas with bright light. 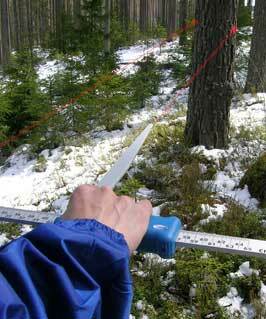 Red laser pointers are suitable in dusk surroundings and thick forests.